ఇది అహమద్ నగర్ లో హరిచంద్ర కోట లో వున్నా కేదా రేస్వర్ స్వామి వారు. కలం లో చుక్క నీరు కూడా ఉండదు...!!! Harishchandragad is a hill fort in the Ahmednagar region of India. Its history is linked with that of Malshej Ghat, and it has played a major role in guarding and controlling the surrounding region. To the east of the temple is a well-built lake called “Saptatirtha”. On its bank are temple-like constructions in which there are idols of Lord Vishnu. 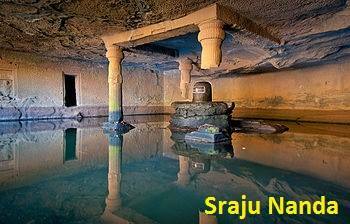 Recently these idols have been shifted in the caves near the temple of Harishchandreshwar. These days many trekkers have been responsible for the sad plight of this beautiful place, as they throw plastic wastes and other things in the pond. 7 years back the water was potable, and now it isn’t suitable even to swim. Kedareshwar Cave. Local legend holds that when the fourth pillar breaks, the world will come to an end. Going rightwards of Harishchandreshwar temple, we come across a huge cave. 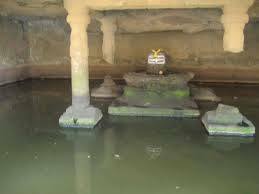 This is the cave of Kedareshwar (see picture), in which there is a big Shivlinga, which is totally surrounded by water. The total height from its base is five feet, and the water is waist-deep. It is quite difficult to reach the Shivlinga because the water is ice-cold. There are sculptures carved out here. In monsoon it is not possible to reach this cave, as a huge stream flows across the way. The most interesting point on this fort is this cliff, which has always fascinated many people from many years. The cliff faces west and looks down upon the Konkan. From here, one can have a breathtaking view of the surrounding region and the setting sun. This cliff is not just vertical, it is an overhang, almost like a cobra's hood. It has been climbed many times. Sometimes a circular rainbow (the Brocken spectrephenomenon) can be seen from this point. It can be seen only when there is a bit of mist in the valley, and the sun is right behind the person facing the valley. One amazing phenomenon that can be observed at this place is the vertical cloud burst, in which the clouds nearing the cliff get sucked into the pit fall area below are thrown vertically into the sky reaching more than 50 feet (15 m). It creates a magical wall that is rising straight from the edge of the cliff without entering the landmass area. The fog show and hovering clouds below the cliff complement the season if one visits.